Free screenings of the new film “Emperor” will be held on Sunday, March 3, at 2 p.m. at the Aratani Theatre, 244 S. San Pedro St. in Little Tokyo, and Monday, March 4, at 7 p.m. at UCLA’s James Bridges Theater, 1409 Melnitz Hall, Los Angeles. 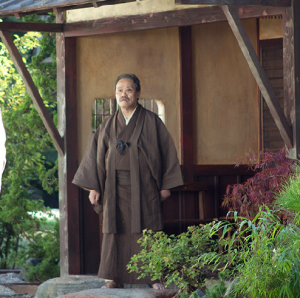 Toshiyuki Nishida as Gen. Kajima. Both will feature post-screening discussion with the film’s producers and experts on the topics raised in the movie. Matthew Fox ( “Lost”) joins with Academy Award winner Tommy Lee Jones (“Lincoln”), newcomer Eriko Hatsune (“Norwegian Wood”), Masayoshi Haneda (“47 Ronin”) and award-winning Japanese star Toshiyuki Nishida (“Tsuribaka Nisshi”) to bring to life the American occupation of Japan in the perilous and unpredictable days just after Emperor Hirohito’s World War II surrender. As Gen. Douglas MacArthur (Jones) suddenly finds himself the de facto ruler of a foreign nation, he assigns an expert in Japanese culture — and psychological warfare — Gen. Bonner Fellers (Fox), to covertly investigate the looming question hanging over the country: should the emperor, worshiped by his people but accused of war crimes, be punished or saved? Caught between the high-wire political intrigue of his urgent mission and his own impassioned search for the mysterious school teacher (Hatsune) who first drew him to Japan, Fellers can be certain only that the tricky subterfuge about to play out will forever change the history of two nations and his heart. Directed by Peter Webber (“Girl with a Pearl Earring”), “Emperor” is based on the book “His Majesty’s Salvation” by Shiro Okamoto. The screenplay is by David Klass (“Desperate Measures”) and Vera Blasi (“Woman on Top”) and the producers are Yoko Narahashi (“The Last Samurai”), Gary Foster (“Ghost Rider”), Eugene Nomura (“Surely Someday”) and Russ Krasnoff (“The Soloist”). The Aratani Theatre screening is co-hosted by the JACCC and the Consulate General of Japan in Los Angeles. The UCLA screening is hosted by the UCLA Burkle Center for International Relations and the UCLA Terasaki Center for Japanese American Studies. “Emperor” will be released in Los Angeles and most major cities in the U.S. on March 8. For more information, visit www.emperor-themovie.com. 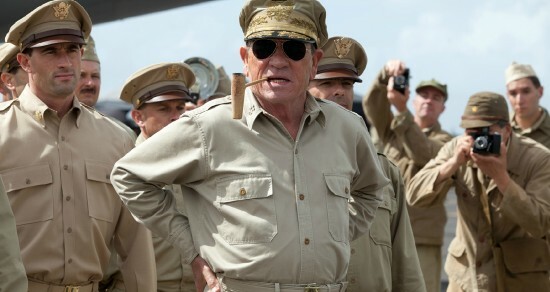 Tommy Lee Jones as Gen. MacArthur.